More Progress in the Front Garden! I wouldn’t say I have a lot of special skills, but one of the things I’m really good at is being obsessive. If you’ve been reading this blog for, say more than two posts, you’ve probably caught onto this fun fact. One thing that my childhood forays into gardening taught me is that almost nothing brings the mercury higher on my obsessive-thermometer than working in the garden. I’m not a terribly outdoorsy person, but hand me a shovel, a few plants, and a patch of land and I will forego nearly all aspects of human functioning and brave bug bites and worms and grubs all day long. There’s just something in my brain that tells me to. I’m still working on the inside of the house here and there, but the ongoing lack of ceilings has kind of caused things to stall out a bit on that front. In the good news category, I think I’ve successfully hired out the ceilings to a competent contractor who is supposed to start the job on Saturday, so I need everyone to cross everything they have that this actually comes to pass. Also in the good news category: all the painful and annoying waiting for electrical and plumbing and drywalling over the past few months has forced me outside, and I’m so happy with the progress there! Sometimes you need things to go a little wrong to force you to redirect your attention, you know? More good news? The weather in the Hudson Valley has been STUNNING. Like, perfect summer. Not too hot, not too humid, lots of sunny days and good rain storms…it’s like this summer was custom-built for gardening. So I guess it’s all good news? Sure. We’ll go with that. SO! Last time I wrote an update on the garden, I’d dug out about half of the front yard, re-set the bluestone path from the sidewalk to the backyard gate, put a little bluestone path of scrap pieces through the garden (which will provide access for watering, fertilizing, pruning, etc…), and planted some stuff. I wasn’t sure when I’d gather the energy to dig out and plant the front half of the yard, but a couple of weekends ago, I totally did it! It started when the plant sections at Lowe’s, Home Depot, and Adams (which is a local grocery store chain with a terrific nursery) all started having sales, and I bought some cheap clearance plants and needed a place to put them. Oopsie! See that? That entire area used to be grass and weeds and clover and other stuff. I dug and dug and dug. Luckily, given the current state of the backyard, all I really had to do was fill a wheelbarrow, bring it into the back, and dump it in the area that used to be covered in asphalt. So all of this digging kind of played double-duty of clearing space for the garden in the front and providing some fill dirt for the back. I haven’t really made any progress on that front, either, but given how much dirt we’ll need and how large the space is, I think we’ll probably bite the bullet and end up having it brought in and graded with a backhoe so that we don’t end up with drainage problems. We need to build up the ground about a foot back there, so all this digging in the front really only made a small dent. But still! It’s better than nothing! Digging out all the old sod was definitely the hardest part of this whole thing. It’s time-consuming, physically tiring, and the results aren’t all that exciting until you start getting plants in the ground and mulch spread out. I think I carried somewhere upwards of 60 very full wheelbarrows to the back. It was intense. My arms are looking kind of awesome, though. So there’s that. Here’s just a reminder of where I started at the beginning of the summer, right after I built the fence! 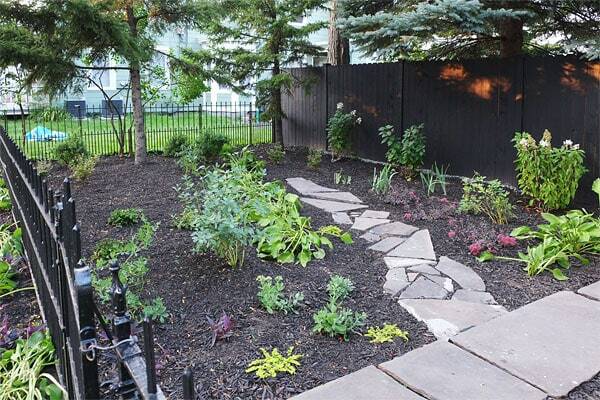 I’m still really happy with this decision…everyone seemed to think I was crazy when I told them I was going to build a fence essentially in the middle of our yard, and even crazier when I said it was going to be black, but not only has it provided a little privacy and kept the dogs safe, it also gave us this wonderful front garden space! I think it all just frames the house really nicely, too…the black really just recedes (you might have to trust me on this one…) and makes the house look so pretty. Zero regrets. And here we are today, a couple months later! The blogger side of me feels a little funny about even showing pictures of the garden at this stage because it has such a long way to go! Everything needs to mature and fill in, I already want to move stuff around, the hostas won’t really recover from their fairly aggressive mid-summer splitting/transplanting until they come back next spring…there’s a lot that needs to happen before it really starts looking good. But that’s OK! Not everything has to be a perfect, beautiful before-and-after, and gardening is one thing that REALLY requires patience. 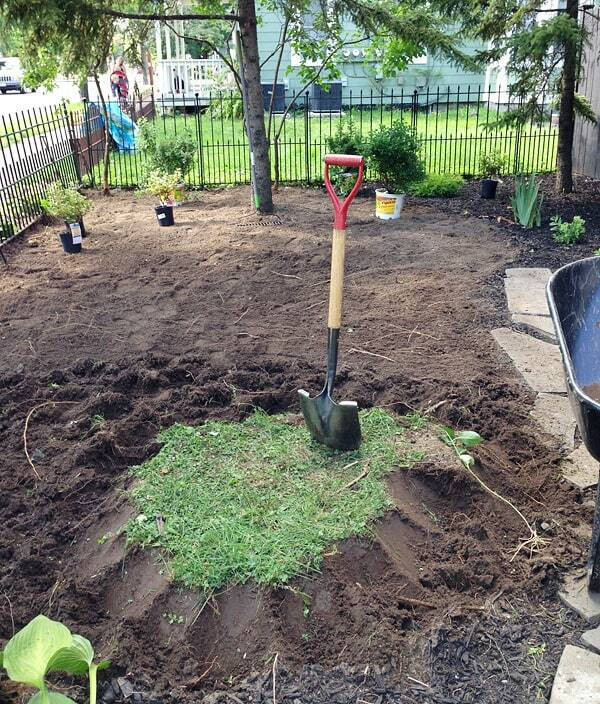 This summer was really about getting the sod out and getting some stuff in the ground. I fully expect to end up moving almost everything around and transplanting things to other parts of the yet-untended yard, but at least the hard part of getting all the sod out is done and things are starting to take root! I’m really glad I did this now instead of waiting a year or two. I’ll be so happy a couple years from now when I have some great mature plants to work with, and the neighborhood is super pleased about it. Spending so much time in the front garden has allowed me to meet SO many of our neighbors, who have been so kind and supportive and encouraging—it’s been really awesome. Nobody really has any way of knowing how much work we’re doing on the inside of the house, but everyone who walks by can see the garden. It’s important to me that the house looks loved and cared for (even with the garden in these beginning stages! ), and even more so because it’s so important to people around us. People really notice this stuff. The neighborhood even got together and brought us a (delicious) blueberry pie! Midtown Kingston gets sort of a bad rap, but man—I’m so happy we live here. It’s such a warm, welcoming place full of such kind people. ANYWAY. For this second half of the garden, I transplanted some creeping jenny and purple heart, even MORE hosta (I hate how much of the same variety of hosta is happening here, but I still have TONS of areas to plant elsewhere, so I’m sure I’ll be happy to have them then! ), and picked up a few new things, too! I moved the autumn joy sedum from this back corner to the front corner and put a couple of small christina marie azaleas in their place, which were on sale at Lowe’s for $6! They seem healthy and nice, though, and should have pink flowers in the spring. I’ve never really loved azaleas, but they were inexpensive, seem appropriate to the house, and I think could potentially be pretty, so I’m giving them another shot. 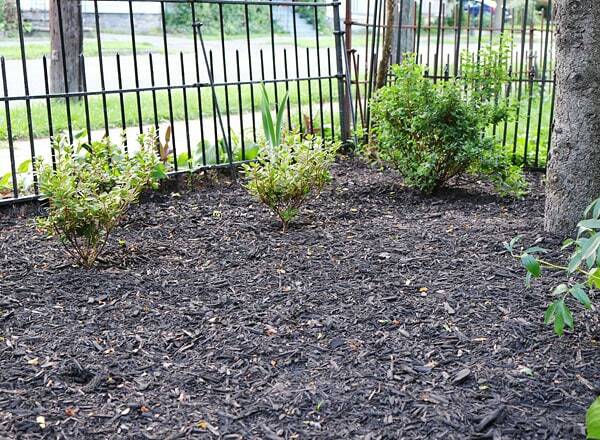 Up in the front far corner, I planted a clump of 3 more azaleas and 3 fairly large spirea bushes sort of spaced around the tree trunk. 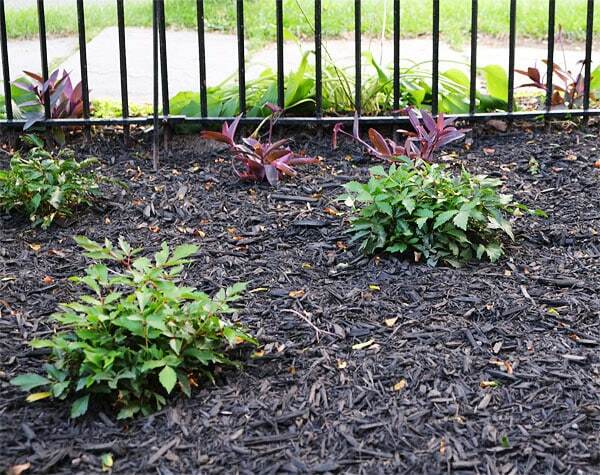 The spirea should have large white blooms…we’ll see! I’m not always a fan of spirea, especially certain varieties, but even the foliage on these seem pretty nice. On the very right edge of the picture you can jussst see some peony leaves (the plant is done flowering for the year), and the big bald patch next to it is full of bulbs! I planted 4 peony bulbs and 8 astilbe bulbs (I was reassured that it would be OK to plant them in the summer instead of waiting for fall…let’s hope so?). I don’t really know if the bulbs will do anything this year but hopefully next year I’ll have plants! And in a few years, plants that can be divided! And spread! Everywhere! Or something. I also picked up a few astilbes on sale, since I sort of just needed some more greenery to fill the space! I like astilbes, though. These are all supposed to have white blooms but the bulbs are a mystery mixed-bag so we’ll find out together! I think maybe this spot is a little too sunny for them, so I may move them in the fall. Near the front of the garden, I picked up two false indigos on sale, which I love! The minty green foliage is so nice, and they look AMAZING when they really become established and fill out. They have very soft blue flowers in spring and these wacky large seed pods the rest of the summer and into fall. They’re supposed to be pretty maintenance free and drought-resistant, which are two qualities I like in a plant. And a man. Oh hey, Linus! The dogs like to watch me from this window while I’m working in the garden. It’s so cute and creepy. I know this is a post about the garden, but to hell with it. I’m CRAZY. I CAN’T BE TIED DOWN. Here’s the porch. I picked up both the chairs and the planter at HomeGoods, and they’re both nice! One of the chairs used to be white, but I spray painted it black to match the other one. Easy. The planter is faux-concrete and I’m relatively into it. I was a little concerned that the chairs would get stolen, but so far, so good! The chairs are pretty visually light and surprisingly comfortable and I like the kind of faux-Acapulco vibe they have going on. I recently picked up an ENORMOUS beautiful antique crock (20 gallons!) for something stupid like $20 (maybe $30? ), so I think I’d like to replace the planter with that when I get around to it. I think it’ll add some nice contrast and make the porch look less HomeGoods Happy, if you know what I mean. Anyway, I’ll stop apologizing for all my wilt-y hosta and just say that I’m SUPER PUMPED about how far this part of the yard has come in the space of a year. It feels really good to be out gardening after all these years, and I’m really excited to see (and show!) how things fill in and shift and change in the coming years! Someday, it’ll be a nice garden. Really. I promise. I think. I’ve never been super serious about my gardening, but if ever there was a time to start, it’s now! I have tons to learn and tons of space to experiment, and I’m really excited about both. Before fall, I really want to make a to-scale map of the garden so that I can remember where everything is and what’s supposed to come back up in the spring (mostly so I don’t mistake them for weeds and pull plants by accident!). I also want to make a spreadsheet of all the plants I planted so I can keep track of all the maintenance required—what gets cut back and what doesn’t, what gets fertilized and when—that type of thing. You could say I have big goals. Wow! So much progress in such a short time. Next year this space is going to be even more beautiful. I always get really weird and creepy in the spring, wandering around our little yard space behind our apartment and staring at the tiny pointy tips of the hosta leaves as they start to push up through the earth. I have a feeling you’ll be doing a lot of the same, with camera in hand! It really does look great- and I love the choice of mulch too. And if gardening produces arms like that I’m gonna go buy a shovel right now! All that work looks great! I look forward to seeing how it all fills in, too. I think the ‘classic’ plants like azaleas, spring bulbs and even the rhododendrons suit your place. Ornamental cherry would look lovely. I really like seeing what it really looks like right after planting. After seeing so many perfect Pinterest mature gardens, it’s easy to have completely unrealistic expectations. As always, I love that your blog is real! Daniel, I applaud your efforts! As one of your, ahem, older readers, I have lots of years of gardening experience and wholeheartedly endorse your driven approach. As you said, gardening requires lots of patience so get the plants in there now so you can enjoy the fruits of your labor sooner! It’s normal to apologize for your own garden when it’s still getting ready for prime time, but I think you already know that you’ll never be completely satisfied nor stop seeing things that could be improved. Getting feedback from others — like with your neighbors — is so helpful because they’re seeing the big picture, not just what you, the garden keeper, know isn’t absolutely perfect. Sharing our garden with others helps my husband and me obtain a more balanced perspective on how we’re doing. Please keep recording your progress (and yeah, I keep spreadsheets on garden plants too)! It’s looking great! Definitely keep a spreadsheet. When we bought our house, it came with a big garden in the backyard, and we are still not sure what everything is or what kind of maintenance it needs. I think we’ll need to make some kind of guide for ourselves as we figure it all out. We’ve got tons of hostas too, and have been dividing and replanting them from the backyard to the front. It’s one of those plants that everyone has but they’re so hardy that they’re easy for amateur gardeners to maintain. And I love the black chairs! You’ve made remarkable progress — way to go! So interesting, Marjo, about the volunteers. I’ve had Baptisias in the DC ‘burbs and northern New England and never once seen a baby (my rose of Sharon trees are a different matter entirely, but that’s OK, because the hummingbirds adore them). But yah, they do get some size when them in a friendly environment. Good to know! I guess I did kind of plant it with the intention of moving it at some point, but I guess it can stay put! I’ll just have to move everything around it if it gets as big as my friend’s did during year 2 (!). His is ENORMOUS. And beautiful. I just had to work one in somehow! This looks amazing! And you are an animal getting all that sod out – the garden is a very pretty backdrop for what must be a spectacular gun show. I really love the way the green plants look against the black fence and mulch, and the path you put in really looks great. Fun to see the garden at this stage, and it will be fun to see as it fills in and blooms. Love the garden. 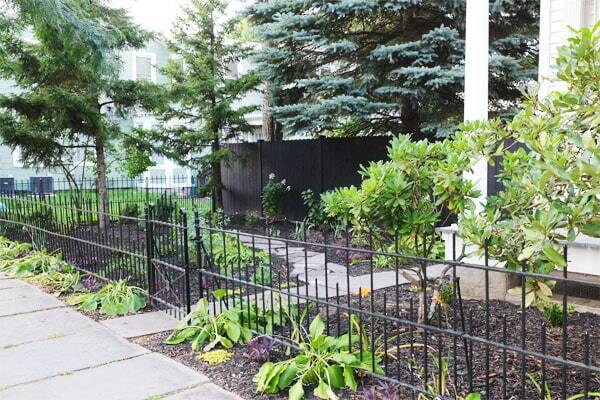 The black fence is going to make this all look super chic when it fluffs out next year! Also, I love that picture of Linus. What a funny little thing he is. And I remember the first post when you brought him off the street – you’ve given him an amazing life, thank you for that. Thank you! I’ll check it out! I don’t really follow the gardening blog circuit at all, but I guess I should start! 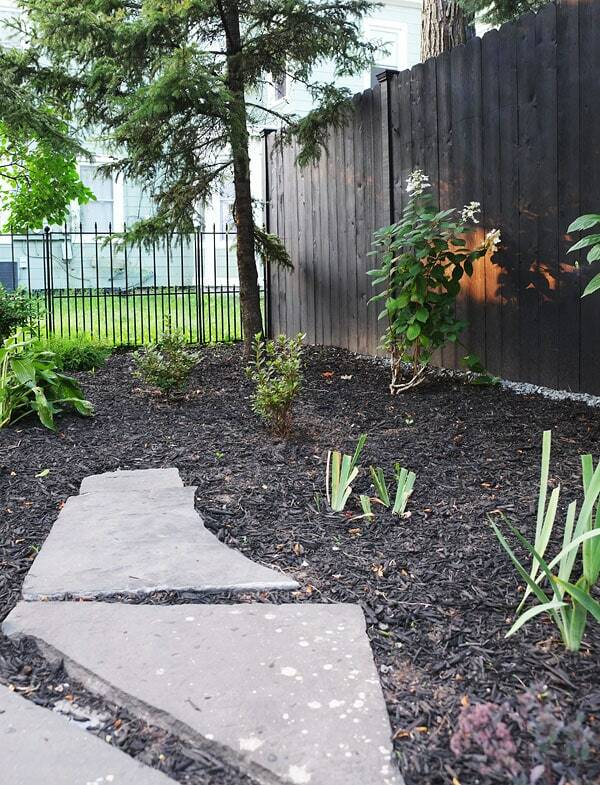 Looks great – I love the black fence and stone path. 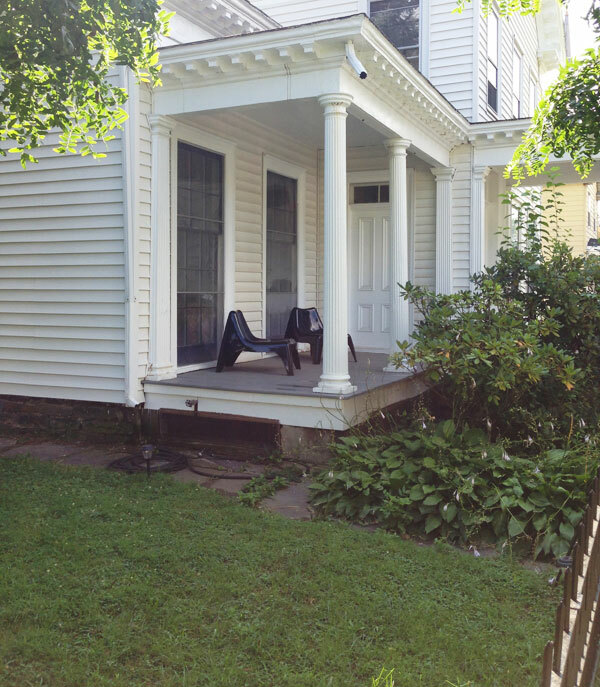 Can’t believe someone took the chairs right off your front porch; hope that doesn’t happen again. Me too! In fairness, it happened at a time before I’d done ANY work to the front of the house, and while we were replacing our roof, and I had the chairs stacked and kind of haphazardly off in the corner—it’s possible someone thought they were just on their way out! They were cheap from IKEA, so not a huge loss, but definitely a bummer just that it happened at all. I’m hopeful that now that the house looks much more cared-for and the chairs are very clearly in use, it won’t happen again. Gah, so much potential pretty!! I love what you’re doing to this place. Seriously, keep up the great work! Looks so good already! I am really envious of your obvious green thumb. I try sooooo hard, because I love to have plants and flowers around me, but everything I touch I eventually kill. :( I’ll keep trying though! Well, who knows what could happen! I’ve never gardened in this climate, this soil, etc…so I may end up killing everything, too! The garden looks great, even if it is still a work in progress. Can’t wait to see how it fills in over the next couple of years. What a remarkable change! You will be even happier next year when everything has a chance to plump up and it looks even more fab. Congrats to hiring out the ceiling – you deserve to focus on other things! It looks great! And I too am a fan of false indigo. They’re so pretty when they bloom in the early summer and fill out so nicely with the foliage. Just be aware that they don’t take to transplanting very well. Can’t wait to see the garden fill out in the next year! Your garden looks amazing already! I grew up in Poughkeepsie and your mention of Adam’s and Hudson Valley summers brought on major nostalgia! I’m a relatively new reader but all your renovations are so inspiring. I hope the rest of your plans go as planned! Daniel…looks really really great..such an improvement….and such a lot of work….but so worth it. 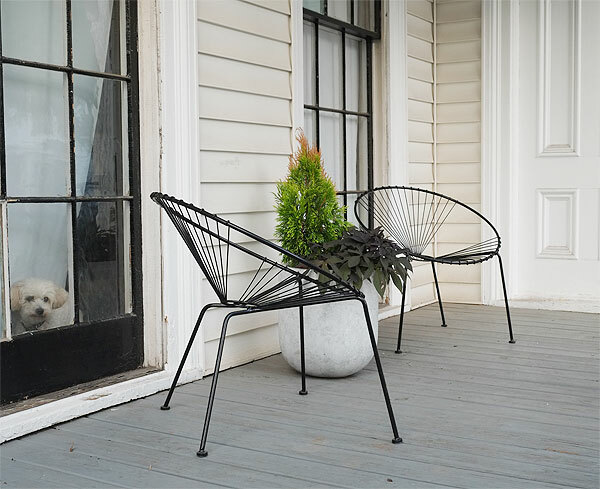 I love the black fence..both the iron and the wood…and those chairs are awesome but I won’t want to sit in them with shorts on..just saying. I’m sure your neighbours love it…that’s the part that they look at …I’d be so happy if the house across from me even cut his grass a little more often..so if you lived across the street I’d be doing cartwheels. …trust me..those hostas will be fine next year….. 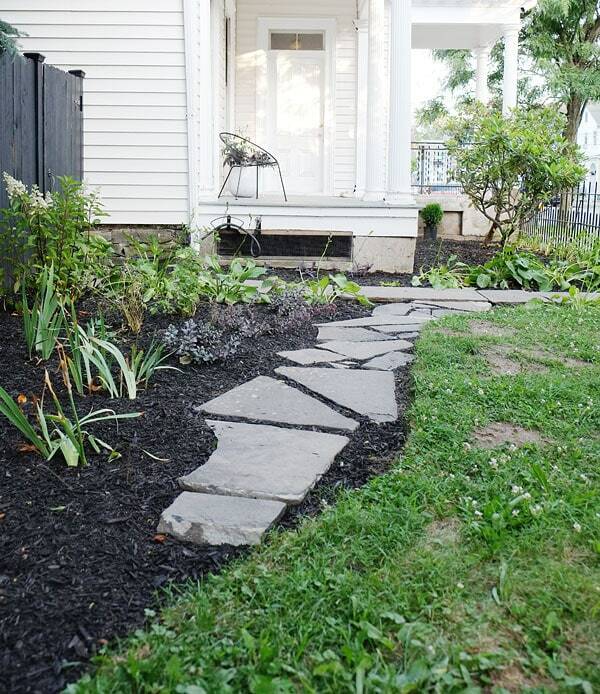 It is looking good, I need to use this as inspiration for removing grass from a small ~5×5 bit of yard on one side of our driveway. I love that we get a “post-planting” after even if it isn’t as dramatic as a “fully mature” after. This is really remarkable, bravo! 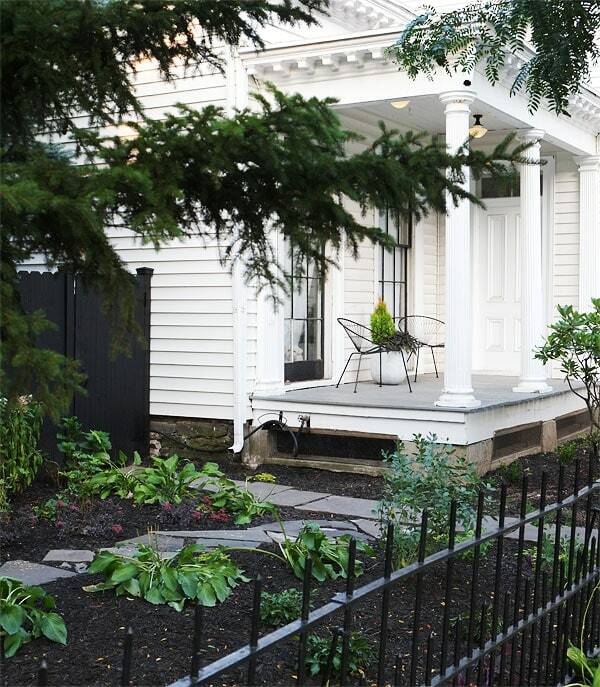 We live in NYC with a teensy porch, and have big dreams to some day move upstate – I’m so inspired by your garden, your patience, and your vision with it. I’ve got my fingers and toes crossed for your ceilings! Love it! It looks pretty now and will look more and more spectacular every year! 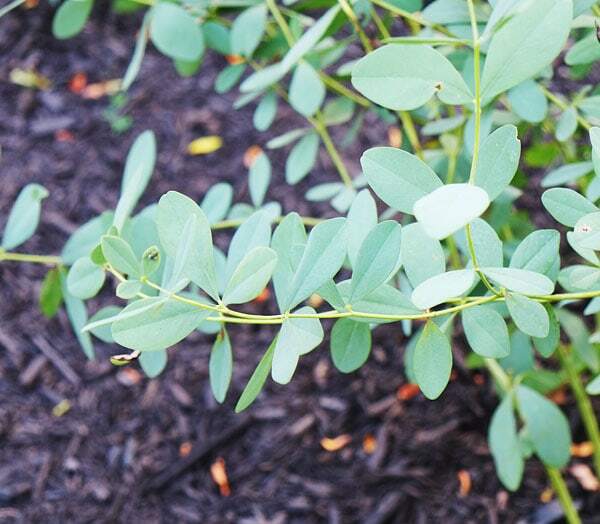 When I first began gardening, I actually drew pictures of the leaves so I wouldn’t accidently weed the plants out. I was VERY new to gardening. I love all your pictures. Fear not. The “wiltiness” will be gone before you know it. I recently moved hostas around and I was very surprised how quickly they recovered. Thanks for all the pictures. I love watching your progress. And your sense of humor. Daniel, love your blog. I read it every week – it kinda parallels my life as I do a top to bottom restoration (rebuild?) of my own, though without a max to help and only one Linus. In regards to gardening the one tip I can give you as one obsessive compulsive boi to another is photography each plant in context. When you go to add bulbs year to year or plant tulips, etc in the fall you won’t remember exactly where the existing ones where from the spring. Now as I add plants I can review the photos (indexed by location of course) of the spot in the different seasons so I can evaluate how the new plant will fit at different times if the year. Btw 2/3rds if my backyard was an asphalt parking lot for six cars when I started! 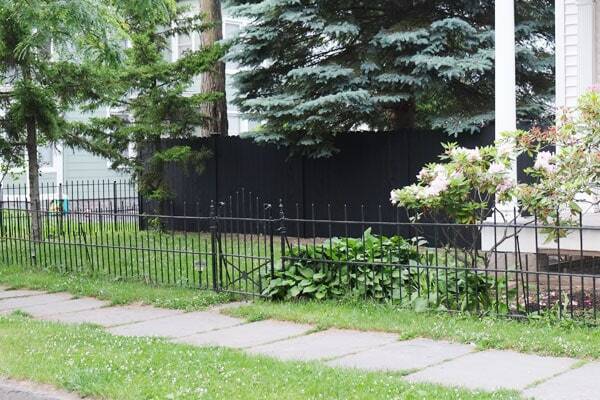 I LOVE the fence and the little front garden it creates. It accents the house so well and yet still recedes, and also the plants really pop in front of it. I’m a liiiitle obsessed with how well it frames everything. The garden is going to be lovely! You have a very particular set of special skills, skills acquired over a very long career. Skills that make you a nightmare for houses like yours. Yikes! A few people brought up this same issue when I posted about the garden the first time, and I honestly don’t know! I have a few friends around here with creeping jenny, and while it obviously spreads (I mean, that’s the point, right? ), it doesn’t seem to run super rampant and it definitely doesn’t seem to kill other stuff! I’ve really only seen it happily coexisting with larger plants around it, which is sort of the idea here. I’ll keep an eye on it, though! I adore your blog. I adore your house, and how you’re approaching its rebirth. This is my favorite read; I share it with like-minded friends. Congratulations on all your fabulous projects completed, and looking forward to the projects of your future. Woot woot! Nice work Daniel! Even though spirea can seem a little gauche, cut it down to the ground every year or every other year in the very early spring and it is the perfect plant, so well behaved. Mine went from a hot mess to a little mound of lovely. That’s GREAT to know, Zoe! That was kind of my big hesitation with the spirea…I’ve seen it look good, and I’ve seen it out of control and looking really bad and scraggly, too. I don’t want that!! I’ll definitely keep the pruning in mind. Thank you! This year, my go-to plant(s) to fill in areas that were a bit bald, if you will, were: Russian Sage, Lavender and climbing roses. I had a few areas in my yard that needed something that would fill in/fill out and Russian Sage did the trick. I used the lavender to fill in areas that were a bit sparse between plantings as well as a long edges. Lastly, I planted climbing roses along a fence I had installed last year. Everything looks great and I am pleased with the results. Sounds so pretty! I’m scared/excited to experiment with some rose varieties later on…maybe on the other side of the house, maybe some here. I’ve never thought of myself as a rose person but there are SO many varieties and I really love a lot of them. In my last house I spent weeks hacking out grass with long, spreading roots in very hard dirt with the broad end of a pick axe. Since the yard was rectangle shaped as were the plant beds and porch, I then dug out a round shape for a brick area and rounded the plant beds and lined them with brick. It was such hard work but it felt so good to look at the finished project. I recently read that Gilbert of Eat, Pray Love fame, goes to a plant nursery each week to see what is being sold that is blooming well, buys a few and plants them in her yard. She does this for the six months or so of the growing season so that she always has something blooming and looking good. Soiunds like a good idea for a lush yard. She has no grass. I no longer have a yard and am happy to have all of that work behind me. A pot on a porch is plenty for me. Hey, no apologies necessary! Your work is absolutely beautiful. Stumbled my way here about a month ago and gobbled as much as I could as fast as I could. It’s amazing it didn’t happen sooner considering how long I’ve been reading Door Sixteen and how we seem to occupy the same corner of the internet. ANYWAY. Gardening has never appealed all that much to me. Probably because my mom would send us out to weed if we bugged her too much during summer vacation. Or not. Not all our issues are caused by our parents. BUT. As soon as you mentioned spreadsheets my heart has been all aflutter. Gardening and spreadsheets. Who knew? I never would have thought of it, but I love how the blue evergreen looks with the black fence in front of it! That will be pretty year round. I love your blog and always look forward to new posts! Oh Daniel, are we twins? I too ripped out my front yard last summer to start a little cottage garden. I may have cried afterward but it was the best thing I did. Love your style. I also re-landscaped all of the garden beds (or, rather, installed them in the first place) around our house this year and found spreadsheets to be a wonderful thing (also for the giant raised veg garden in our backyard). At least until shade perennials go on sale at Breck/Wayside/MI Bulb/JP and then the grab bag of hostas is so cheap and the mixed bag of unknown perennials sounds so fun and mysterious and then you only need $2 to get free shipping (bottle-brush flowers for $3? sure!) and then UPS delivers a freighter of a box to your doorstep, which you totally forgot about and did not plan in your spreadsheets. Growveg.com/Farmer’s Almanac was a great planning resource – they’ve got a lot of plant varieties in their system and anything outside of their list you can put in dimensions for as needed. Its basically a spreadsheet program that keeps track of your gardens year-to-year where you can “drag and drop” plants into designated spaces and it’ll give you an idea of the estimated size of the mature plant, growing and watering conditions, bloom/fruit time, etc. Spreadsheet all of the things. ← How to Do Pretty Much Everything Wrong: Front Door Edition!